Unique and One of the Kind Dream Catcher Necklace. Made with Heavily Electroplated Silver Wire. Each Dream Catcher is Handcrafted and Unique and no two pieces are ever alike. Genuine Rose Quartz Crystals are used and may have natural specks and inclusions. Center has Tumbled Stone and Hanging Charm is also made from Tumbled stone. Dream Catcher Size: Approximately 1 ½ inch and Light Weight. Comes with Adjustable Cotton Waxed Cord Necklace and will adjust from 15 up to 24 inches so you may wear it long or short. 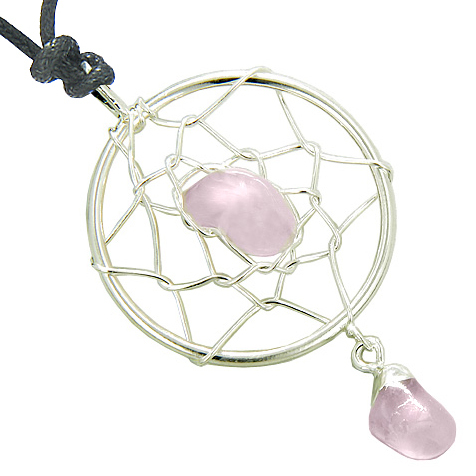 This is Naturally Unique and One of the Kind Dream Catcher Charm Necklace made with Rose Quartz Gemstones. This Dream Catcher is made with Genuine Gemstone and Crystals and may have natural specks. It is Made with Heavily Electroplated Silver Wire and looks absolutely Gorgeous. These Crystals are Handcrafted from Brazilian Gemstones and made exclusively for Best Amulets. Stay Lucky and Unique with your Own Individual Crystal Dream Catcher Amulet.